Can’t decide between cornbread dressing or traditional bread stuffing? Here is a recipe that combines the best of both! Please also see the included printable recipe. Living in the center of the Heartland can make Thanksgiving a little confusing. Should I make a cornbread dressing like they make in the South or a bread stuffing that is more common in the North? My family has roots on both sides of the Mason-Dixon line, so choosing one or the other means somebody isn’t happy. Unfortunately, I couldn’t just prepare the family recipe because it was no more than a list of ingredients. No quantities were listed. Well, unless you count my grandmother’s not at all helpful “ten cents worth of sausage”…and I don’t. So, I struck out my own. I researched on-line, asked friends to share their favorites, and made batch after batch of dressing over several years. I am happy to report that I finally perfected my favorite by piecing together components of several different recipes. Everyone who has tasted it raves about the flavor. The main secret to this dressing recipe is the use of biscuits AND cornbread AND dried stuffing cubes. In a nod to my grandmother, I do use sausage, but not ten cents worth. It turns out that 12 ounces of raw breakfast link sausages works well. Oddly enough, after removing the casings and mixing the raw sausage into the dressing, it is not readily apparent that sausage is even in the dressing, but it adds a LOT of flavor. I strongly recommend making this as a dressing baked in a dish separate from your turkey. Because this recipe contains both raw sausage and an egg, it cannot cook to a safe temperature when used to stuff a turkey. Here is a nifty little trick that I learned from my mother and grandmother–start with the minimum amount of salt and poultry seasoning. Then, after you mix the dressing, form a small amount into a little pancake and fry it it in a little butter to cook the egg and sausage. This will allow you to taste it and decide if you prefer more salt and/or poultry seasoning. This recipe makes an ENORMOUS amount of dressing. I usually fill a 9 x 12 inch dish with the dressing for Thanksgiving day and then use the rest to make some Stuffing Muffins. These freeze exceptionally well. Since I also freeze some cooked turkey, we are all set to enjoy some quick turkey dinners all winter long. You might also want to save a cup or so of dressing to add to your gravy. It helps gravy to thicken while adding additional flavor. Just be sure to let it simmer until it is dissolved. 1. Bake cornbread and biscuits using the instructions on the label. 2. Cool and roughly chop biscuits into large cubes. 3. Let biscuits and cornbread sit out uncovered overnight to dry (or put in cooled oven). 2. Melt butter in a pan over medium heat. 3. Add onions, celery, and salt. 4. Saute, stirring occasionally, for about 10 minutes until soft. 5. Scramble egg in a very large mixing bowl. 6. Add raw sausage with the casings removed, poultry seasoning, and parsley. Mix well. 7. Add cubed stuffing and mix well. 8. Lightly toss with chopped biscuits and cornbread. 9. Add broth and mix again. Avoid over mixing, but incorporate most of broth for a heavier dressing, less for a slightly fluffier dressing. 10. Place in a large baking dish and bake uncovered for about 45 minutes-1 hour at 350. The top should be light brown. Alternatively, portion some or all of the dressing into a muffin tin lined with cupcake liners. Bake for about 30 minutes. If you put half of the dressing in a muffin tin and the other half in a regular baking dish, the dressing in a baking dish will take about 30-40 minutes to bake. Due to raw egg and pork, do not stuff a turkey with this recipe. I hope that you enjoy this dressing, at Thanksgiving or anytime of the year. Do you love stir fry, but find the prep work tedious? I felt the same way until I learned some easy short cuts that not only cut back on my prep time, but also meant less clean up time. One of those short-cuts involved the mixture of garlic, ginger, scallions, and red pepper flakes that add complex flavors to my stir fries. No matter what meat or vegetables I cook in my stir fry, I always make a little well in the center and quickly fry some aromatics in it before adding a sauce. Unfortunately, it takes a long time to mince the aromatics small enough that we don’t end up biting into a big, unappetizing hunk of garlic or ginger. I could use the food processor, but I don’t want to get it dirty for such a small job. I also don’t want to have to buy ginger every time we have a stir fry and ginger doesn’t really last all that long. The solution that works for us is to prepare enough aromatics for several stir fry dinners at once and then freeze them in ice cube trays. Unless you love chopping food into tiny bits, use a food processor to mince the garlic, ginger, scallions, and red pepper flakes. I try to process until it is just short of a puree. Spoon the mixture into an ice cube tray in 1 TB portions, making about 18 portions. Press the aromatics in tight and then spread the sesame oil over the top where it can soak in and fill in any holes before freezing. When you are ready to make a stir fry, get an aromatic flavor cube out as soon as you start cooking. This will allow it to thaw a little before mixing into your stir fry. I set the cube near the pan to help the thawing process. This mixture can also be used to flavor a marinade for grilling meat. Simplify stir fry with aromatic flavor cubes. Happy Cooking! I have a minor obsession with centerpieces. Over the years, I have tried one thing after another, never satisfied with my efforts. I guess it is important to me because centerpieces are usually the focal point of any dining room, so I want ours to make a statement. Unfortunately, sometimes that statement was, “I am too tall to have a conversation over” or “I am really easy to knock over”. More than once it turned out to be, “I looked good on Pinterest, but I don’t work in real life”. Even when a centerpiece was attractive, the look was always marred by the practical items that needed to stay on the table for meals. Finally, it occurred to me–why not make those functional items into one centerpiece? Doing so had the added benefit of allowing us to stop moving items to and from the table every day. There are many possibilities for a container in which to place your centerpiece items. The one that I used is technically a condiment server. When I was looking for just the right item, I also looked at trough planters, caddies, old wooden toolboxes, and even copper fish kettles. I especially wish I had seen this gorgeous wine trough to use as a centerpiece. Etsy has some great options, but I also looked on Amazon and Ebay. The item that I eventually bought is 18″ long, which allows space for me to place food on either end when we eat. If you have a long table, you might go as long as 24″ or possibly longer. As you can see, mine is divided into sections, but I am not sure that I would choose a sectioned centerpiece again unless the sections were at least 7-8 inches wide. This would have allowed the trivets to fit in without angling them. Also pay attention to the height of the items that you want to put in there. These sections are 4″ deep and my salt and pepper shakers are just barely tall enough to easily access. If you use a shallower container, you might use jelly jars or other containers to hold items upright. The items to put in your centerpiece depend entirely on what you typically need at the table. For us, that meant napkins, trivets, salt & pepper shakers, silverware, and the pink-striped tea towels that we use as place mats. You could also consider other condiments than do not require refrigeration. Another possibility would be placing all of your serving spoons in your centerpiece. I hope that you are inspired to design your own useful centerpiece. Happy Decorating! I didn’t particularly like the gas fireplace insert that came with our older home, but a new one was not in the budget. My next thought was to buy a fireplace screen to cover it up, but they were all expensive, unattractive, or you could see through them, which rather defeated the purpose. When I fell in love with an old stained glass window in an antique store, I knew that I had to have it, but could it serve as a fireplace screen if I attached some shelf brackets? I decided to buy it and figure out the “how to” later. After some thought, the answer came after I bought the shelf brackets and realized that the metal part inside could be unscrewed and turned upside down, such that the large part where the screw was inserted was at the bottom and the smaller part was at the top. Once the screw was attached to the stained glass window, the window sat on the brackets, even without wood glue. Still, for added strength and stability, I used wood glue and secured the bond with C-clamps to dry overnight. Incidentally, I chose these particular shelf brackets because the open design would allow me to easily attach the C-clamps. Once the brackets were attached, I taped off the glass and painted all of the wood black. 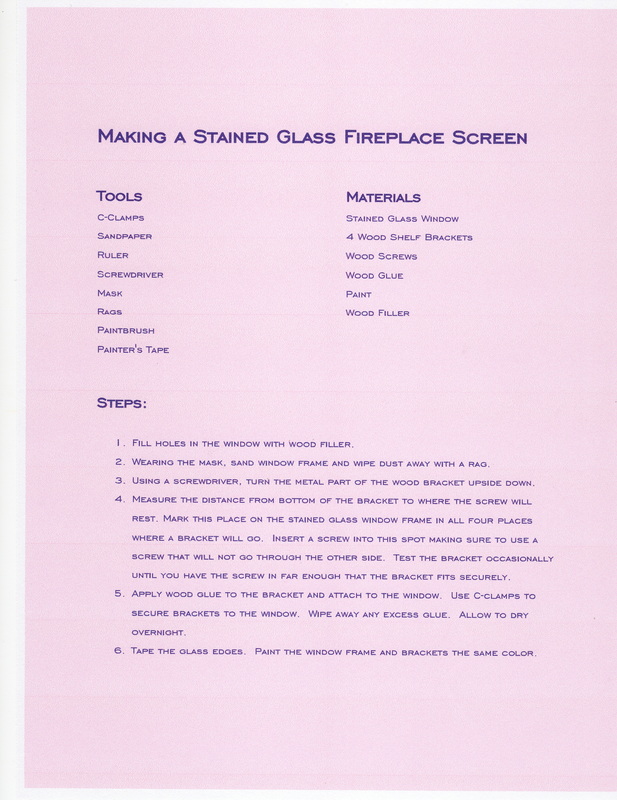 It should be noted that a fireplace screen such as this should not be placed in front of an open flame. Our fireplace has a gas insert, so all flames are behind glass. A fire lit up the stained glass, but we just don’t light our fireplace all that often. I eventually tried Christmas lights hung on a couple of nails behind the glass. Much better! The warm lights give the room a nice amber glow at night. Please click here for a printable list of tools, materials, and instructions.